If you’re anything like me, you’ve watched the video clip of Declan learning to roar about 8 zillion times on Instagram. (If you haven’t, watch it here.) It might just be that I’m his mom and find it incredibly adorable and it breaks my heart because he’s so darn cute but then hearing him roar and giggle just puts all the tiny little pieces back together and I feel warm and fuzzy inside so I watch it again. 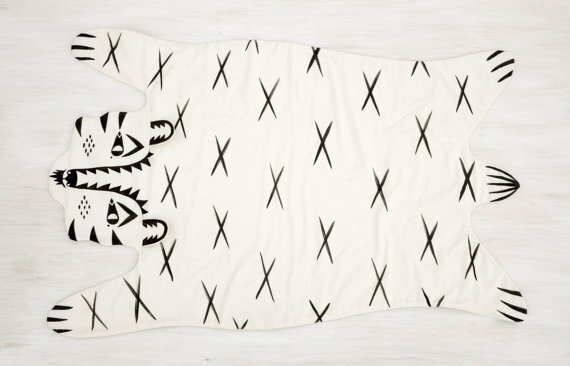 So now that we’ve established Declan is the cutest little roarer there ever was, I think he really needs one of these amazing tiger blankets by Roxy Marj. There’s also a lion and a bear. All animals that roar. Maybe he needs one of each? These things sell out so fast so I haven’t been able to get my paws on one (#seewhatididthere) yet but I can’t wait! Maybe it’ll be a Christmas gift for our little cub. Which one is your favorite – the lion, tiger or bear? Anything else ridicute that I need to know about right now?